An immersive, one-of-a-kind summer experience for high school girls in biotechnology. Click here to learn more! of students are accepted into four-year colleges, universities, or service academies. countries are represented by the student body, whether by citizenship, dual citizenship, or students living abroad. 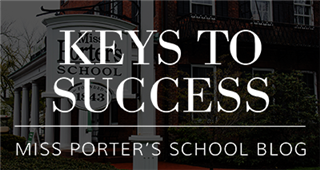 Visit Keys to Success, the school blog, for more stories about Miss Porter's School, our students, and more! Leaders learn here. Over four years, our leadership program instills a set of core competencies and encourages students to identify and harness their gifts and passions. With this foundation in place, our students are ready and prepared to lead—locally, globally, and for a lifetime. To change the world, you must see the world. To ensure our students become globally engaged citizens, Porter’s fully funds, at no additional cost to students, an international travel experience for all juniors. You will gain a more profound understanding of multiple perspectives and cultural practices other than your own and how to navigate between local and global by spending two weeks immersed in one of our international host schools. Our proven ability to develop strong female leaders has been replicated decade after decade with unquestionable outcomes. Bound together by their experiences in Farmington, our graduates join a network of accomplished alumnae with whom they will always be connected as they shape a changing world. Miss Porter's School educates young women to become informed, bold, resourceful and ethical global citizens. We expect our graduates to shape a changing world.